Father John Nicholas Grou, S.J. 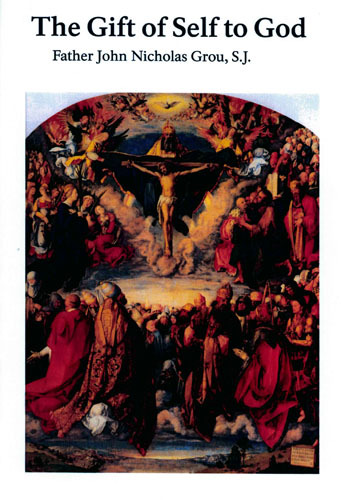 This timely monograph, composed by Jesuit Father Nicholas Grou, contains precious gems of holy wisdom. They are the fruit of a pastor of souls well acquainted with the latter-day stratagems of an experienced adversary determined to get the focus of persecuted and battle-weary Catholics off the straight and narrow course leading to Boromirpersonal sanctity. The Gift of Self to God, which is the heart of the composition, is an extremely provoking and healing meditation dealing with the necessity and salutary advantage of giving our all to God. It is a perfect compliment to the spirit of Saint Louis Marie de Montfort’s True Devotion to Mary. Not as well known as he should be, the work of this great doctor of the interior life is reprinted here, together with two of his other essays, all of which confirm the virtue of filial trust in God. 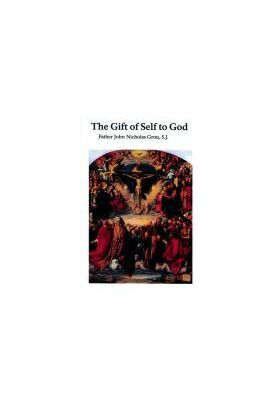 1: What is Meant by the Gift of Self? Jean-Nicolas Grou was born in Calais on November 23, 1731. He studied in Paris, where in 1746, he entered the Society of Jesus. He was ordained a priest in 1762, and taught in Jesuit schools until the suppression of the order in France in 1764. Fr. Grou was then sent to Nancy in Lorraine, (then independent of France), and took his final vows as a Jesuit in 1765 at pont-á-Mousson. The Jesuit order was abolished in Lorraine the following year, when that territory was annexed to France. Fr. Grou then returned to Paris where, at the request of the archbishop, he composed an apologetic work under the pseudonym “Le Claire.” He served as spiritual director to Benedictine monks and others, and made a name for himself as a translator of Plato. In 1770, Fr. Grou turned to a more ascetic life, and from that time on he wrote exclusively on spiritual subjects, promoting devotion to God amongst the faithful. The Revolution forced him to leave France, and in 1792, he went to England where he stayed at Lulworth Castle in Somerset. There he served as spiritual director to the family of his host, Thomas Weld, founder of the Catholic college at Stonyhurst and father of Cardinal Thomas Weld. He never learned English and had no official position while working in that country. It was said of Fr. Grou: “Living with God, he has no need for company.” In 1803 he renewed his vows of profession in the reconstituted English province of the Society of Jesus. After eleven years to the day at Lulworth, Fr. Grou died there on December 13, 1803, and was buried in the chapel of the castle. Fr. Jean-Nicolas Grou, S.J., wrote four retreats for his host Thomas Weld. The fourth of these retreats, entitled “On the love of God,” was published in London in 1796, and later in France. Fr. Grou revised this booklet shortly before his death, and the revised edition was published in Paris in 1867. He added an appendix to that work entitled “A small treatise on the gift of self to God,” an elaboration of spiritual reflections he had composed for Miss Weld, the daughter of Thomas. This treatise is published here in the translation of a monk of Parkminster based on the 1867 edition. To give oneself to God is to consecrate to Him all our thoughts, affections and actions in such a way that the mind is occupied with Him alone, or with such objects as it is His will that we should attend to according to the needs of the moment. It means that the heart loves Him above all things, and created things only in reference to Him according to the order which He Himself has established. All that we do and all that we suffer, is referred to Him, and His glory and good pleasure is our end and principal intention in everything. To give myself to God is to renounce all idea of being my own master, in order that I may submit in all things to the guidance of grace. It is to give up my self will completely and will only what God wills. It is to give up my liberty in order that He may dispose of it Himself and direct it as He pleases. The Christian who gives himself thus to God no longer belongs to himself. He no longer has any rights over himself, but places himself in the hands of God or of those who stand in His place. He would not wish to form any plan or embark on any undertaking or allow himself the least desire of his own accord: in a word, he has handed himself over to God. He looks to God to make known to him His will, and is always ready to carry it into execution, without reasoning or offering any excuse in spite of his natural inclinations or repugnances. At first sight, so complete a dependence is frightening, and would appear to hold the soul in an in­tolerable kind of restraint. We shall see, however, in what follows, how God can soften this yoke, and how love renders it agreeable. Without allowing ourselves to be discouraged by foolish imaginations which have no foundation in fact, let us begin by examining the reasons which should induce us to give ourselves to God. There are any number of reasons, and it would take too long to consider them all. I will confine myself, therefore, to the principal ones. Is it not eminently just that I should give myself entirely and without reserve to Him Who drew me out of nothing, and Who at every moment of my life maintains the existence He has given me; Who is my beginning and my end, the Sovereign Good from Whom I have received all and from Whom I expect all, and without Whom I can never be happy? What need has God of me? Absolutely none. Whether I exist or do not exist, whether I give myself to Him or not, it will not affect His happiness in the least. Why then does He demand that I belong to Him entirely? It is because right reason and order require it. It is because God cannot, by the very nature of things, allow me to remain my own master, nor to give myself to anyone but Him. If I claim to have the right to dispose of myself as I please, I am usurping His rights and robbing Him of something which belongs to Him alone. If I give myself to anyone else, it could only be to a creature to whom I cannot give myself and who cannot receive me without grave injustice and, without my com­mitting the greatest outrage I could, namely, that of pre­ferring a creature to my Creator. But as it is just that I should belong to Him, so it is also just that I should be His in every way and for ever; for never, at any time or in anything, can I withdraw myself from His dominion. His rights extend to all I am, in whatever state or circumstances I may be. He created me and only could create me for Himself; and I abuse my mind if I use it for any other purpose than to know Him; my Heart, if I do not pour out all my love on Him; and my liberty, if I make use of it otherwise than in pleasing Him in everything. Simi­larly, I misuse all the faculties of my soul and body if I em­ploy them otherwise than conformably to His intentions. It is not enough not to offend Him: I must make it my study to please Him, and thus at every turn to do His will. Nothing is left at my disposal, any more than it is to the angels and blessed in heaven. Has not our Lord taught us to say to our heavenly Father: “Thy will be done on earth, as it is in heaven?” Is there a single instant or occasion when the will of God is not being done in heaven? We, then, are equally bound to try to accomplish that will as fully and as continuously on earth. The only difference between the blessed in heaven and ourselves is that they can never do anything but the will of God (since it is their fixed state), whereas we in this life unfortunately can always choose to do our own will. Never­theless, it is just as indispensable for us as for them to know no other rule than the divine will. Thus, whether I consult my conscience or my reason, my religion or my faith; whether I consider Who God is in Himself or in relation to me, all makes it an obligation for me to give myself wholly to Him and to Him alone. Everything concurs in telling me that this is my first and my most bounden duty. God being my supreme good, there can be no happiness for me, either in this life or in the next, except through union with Him. In this life, where I can only know Him by faith, in what way can this union be realized other than by giving myself to Him so that I may belong to Him for ever, by the submission of my mind and heart to Him so that they make one with His in thought and affection? For it is in this conformity that union of spirit consists. God has given me the gift of discernment and made me free, in order that, knowing Him as He is in Himself and what I am in relation to Him, I may, by an enlightened choice of my will, enter into a union with Him which is unique and inviolable. His inten­tion is that this gift of myself, being free, shall give glory to Him and merit to me, His creature. That is to say, in giving Him glory by a love of preference, and finding in that love my happiness even in this life, I shall merit to glorify Him eternally in heaven, and to find there the consummation of my beatitude in the consummation of my love. It is not for His sake but for mine that God makes this demand of me. He does not need me, but I cannot live with­out Him. He is supremely happy in Himself, whilst I can never be happy apart from Him. Can I find my happiness in myself? No! All that I see in myself is my own indigence. This is not surprising, since I am a creature drawn out of nothing. Can other creatures, can all that the world offers me, make me happy? Still less! Like myself, they are all drawn from nothing, and are as empty in their depths as I am. If I did possess them all and for ever, my heart would still be empty, still starved and hungry for my true and supreme good, which is God Himself. Until my heart belongs entirely to him, it will know no rest; it will always be yearning after, always regretting something. But when it possesses God, ah! Then, what happiness, what peace, what fullness of joy! No longer will my heart be a prey to that weariness of the spirit which torments and consumes the soul that seeks not its happiness in God. But the human heart will never possess God until it is itself possessed by Him. God gives Himself to us in the measure in which we give ourselves to Him. ALL FOR ALL! Never say: “I will give myself to God... but all in good time! There is no hurry; I have plenty of time to think about it.” To speak thus would be as false as it is foolish. It is false, because I have only the span of this life, proverbially short and uncertain, in which to give myself to God. I cannot be certain of a month, a day, not even of an hour; only the present moment can I call my own. If I do not make my resolution now, can I be certain of making it at some future date? Will I be alive then? At this moment grace solicits me strongly: if I reject that grace now, will it not reject me? Has God given it me so that I can use it as and when I please? Will the effort cost me less tomorrow than it does today? If I put it off, perhaps I may never have the courage to do it! Besides which, is it not foolish in the extreme to defer from day to day the act which is going to introduce me into the only way which can ensure me real happiness? Is it wise to postpone what God urges, when I know that delay will only bring its regrets? Must I be reduced to saying with St. Augustine: “Late have I loved thee, O Beauty ever ancient, ever new: late have I loved thee !” As it is, O my God, even now I have to reproach myself with this, and still I delay. Why make the reproach still more shameful, and my heart more bitter? How sorrowful such a reproach is to a heart divine Love has wounded! If my heart, then, has received so great a grace, how can I refuse God what He asks of me; how can I refuse to receive gratefully at His hands this most blessed of wounds? If only I realized how foolish I am to delay so long this entire gift of myself!